Please refer to our stock # TBD00200 when inquiring. 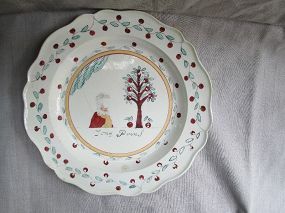 An English creamware plate with a molded edge that was exported Holland and decorated there with over glaze enamels. The plate almost certainly depicts the son of William V, Prince of Orange. The sone would become William I of the Netherlands. Born in 1772, he would be the, “Jong Prins” as inscribed in black on the plate. Interestingly the face has been left unfinished. The boy faces an orange tree with fruit on it and a couple of them on the ground. The surround is a wreath of red oranges and light green leaves. 9 ½ (24 cm) diameter. Condition: a scratch to the left of the Prince. A fair bit of enamel loss, especially to the orange/reds. A small discolored hole in the glaze and a few tiny rim chips.